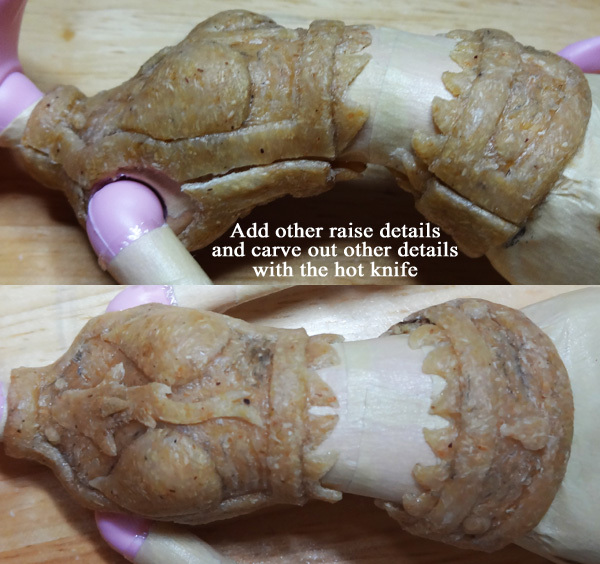 Years ago I wrote a tutorial about doing Worbla armor for bjds, but this one specialized for commercial dolls instead of bjds since there are some steps that can be omitted when you're not working for resin. This is part 1 of the tutorial, subsequent parts will be separate pages linkded at the bottom. Foreword: This is just one of many ways that outfits and pieces can be made with thermoplastics. There's a million other ways you could probably think of to engineer pieces, so this tutorial basically gives some tips and guidelines. I've already thought of several other design ideas for clasping the pieces together. I can share those later as I make new things. Get creative! Thermoplastics are very versatile and easy to work with. When you finish pieces, you want to keep them away from heat, but they will be fine as long as it's not super hot, like I have to put my hairdryer on it's highest heat setting to soften Worbla. Low and medium doesn't do anything to it. Also note that generally the material cools and re-hardens again pretty fast, so you should be working on small sections at a time. 1. So first thing you want to do is prep a bait doll by wrapping it a thin layer of plastic wrap, then cover that with masking tape. Use small pieces in more tightly shaped areas to get it to form as close to the body as possible. You want to avoid any bumps and wrinkles. 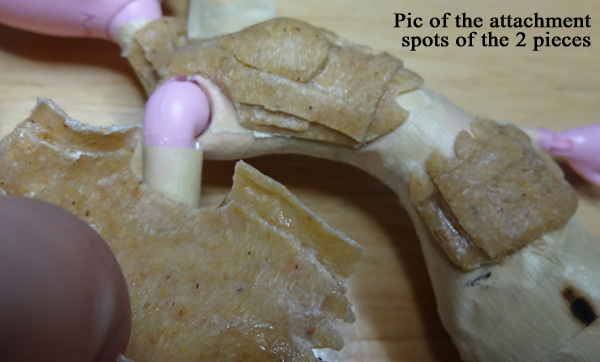 It's best to use a bait doll body because if you're using a heat knife, there's the possibility that either you could slip, or part of the knife could accidentally touch part of the body while you're using the tip on another part. Think you get the idea. The wrapping is partly to protect the bait doll so it can be used for multiple sessions, but also to provide padding so that there's just a little bit of room inside the armor and it's not totally skin tight so they can be worn over a layer of clothing or lined on the inside. 2. You can sketch out your idea if you want to, but it's not necessary if you're good with working on an idea from your head or you just want to wing it. 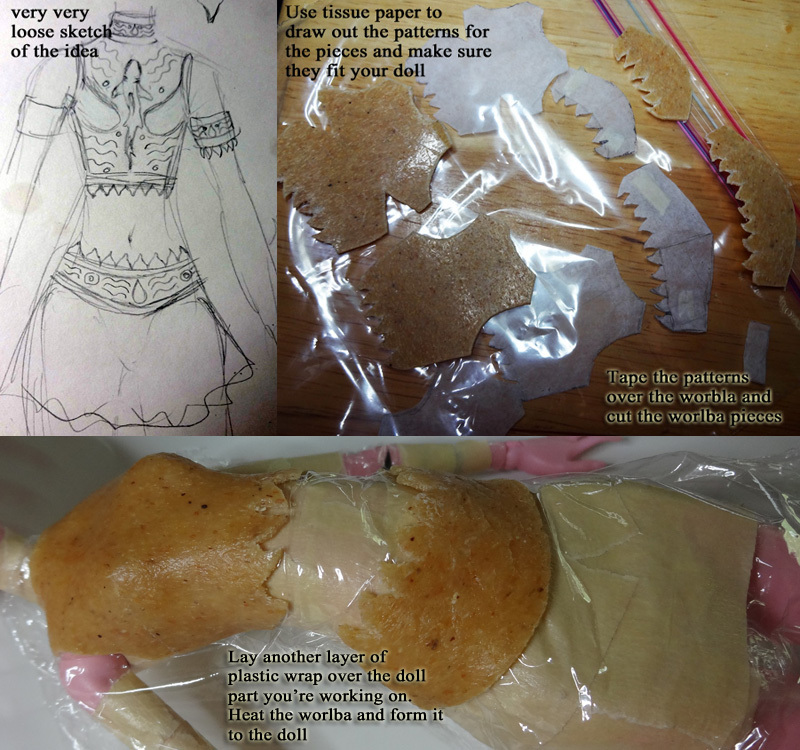 Whatever your choice, use tissue paper or something else thin to draw out your pattern pieces and fit them to the doll. Where you have rounded areas like the breasts, use little v-shaped cut-ins to remove excess material so it doesn't wrinkle when you get to forming your piece. The way I have mine set up, the front of each base layer reaches a little farther around than the back layer does, because I'm placing pegs on the edges of those for the upper layer of the back piece to overlap and latch onto. Heat the front pieces and form them to the body. 3. Use masking tape to cover the edges of that front layer you just laid down so that the back layer won't stick to it. Heat the back layer pieces, form them to the body and line the edges up with the front piece. 4. 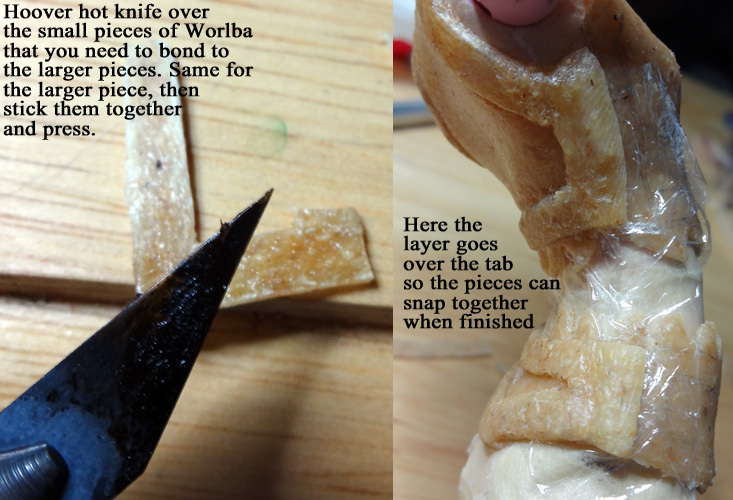 Cut some little pieces of Worbla, heat them and the edge of the armor (by hovering the hot knife over them so that the heat gun or hairdryer don't blow them all over the place) so you can bond the little pieces to the edges to form tabs for the overlapping back to latch onto. If that sounds confusing, hopefully the picture is more explanatory. Cover those tabbed edges in plastic wrap so you can form the overlap to it without it sticking. 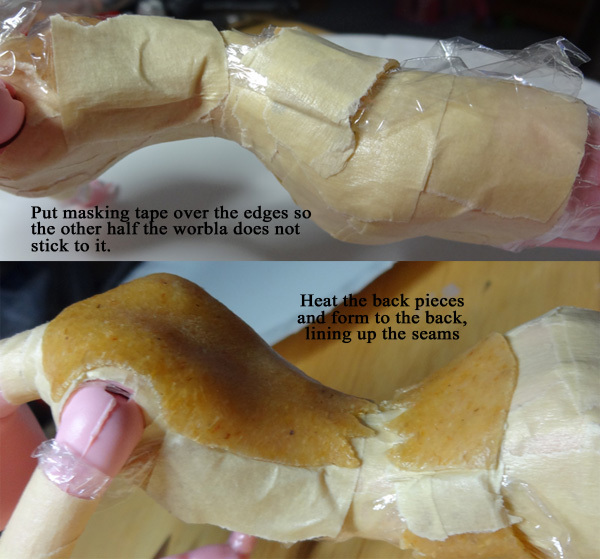 Make sure the plastic wrap goes UNDER the back side because the overlap will need to stick to the back side. 5. Here we start laying down the edging. I made the front part longer so that the overlap from the back can hook over the tabs on the front, and that's how the piece stays together when the doll is wearing it. From here on out, it's best to use a heat knife for softening and merging pieces together because you'll be working with small pieces that can be easily lost if blown away. You can hover the knife over a piece, or hold the 2 surfaces close to each other and hold the hot knife between the 2 pieces, so they both heat at the same time and you don't have to worry about one surface cooling before you can get the 2nd one softened. 6. Again use masking tape, this time over the edges of the back, so that it doesn't stick as you're laying down the front edging. 7. Add any other raised details that are part of your design and use the hot knife to carve out other details. This is the rough finish of the torso pieces. I plan to go over it again and look for any rough portions and smooth them over with the hot knife. The last pic is a view of the connections, a bit hard to see, but I think you can get the idea.